We are a small breeder striving to produce top-quality, belton-type English Setters. We produce one or two litters of puppies a year, offer stud service for select dams, and occasionally have started dogs. Our objective is to produce good looking, biddable, intelligent gundogs typical of the classic old bloodlines of setters. 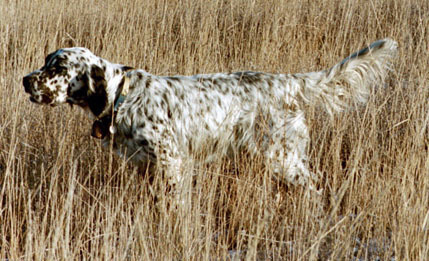 To accomplish this we linebreed individuals of Ryman and Old Hemlock descent and occasionally outcross to other lines of English Setters such as Llewellins. 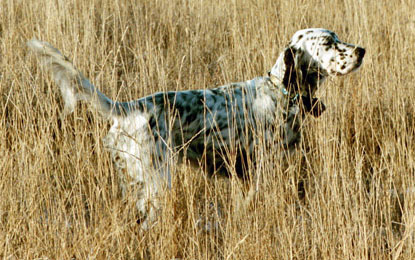 These are naturally close working lines of setters that have traditionally been hunted on grouse and woodcock but are preferred by many people for hunting quail, pheasant, and prairie grouse as well.